Thank you for your interest in participating in our Program. By now we imagine you have carefully read through the Program information , and have contacted CCC with any questions you may have had. Email alice@asiacouncil.org the following digital documents. a high-resolution, easy-to-read scanned color copy of the picture page of your passport (JPEG, GIF or PDF format). 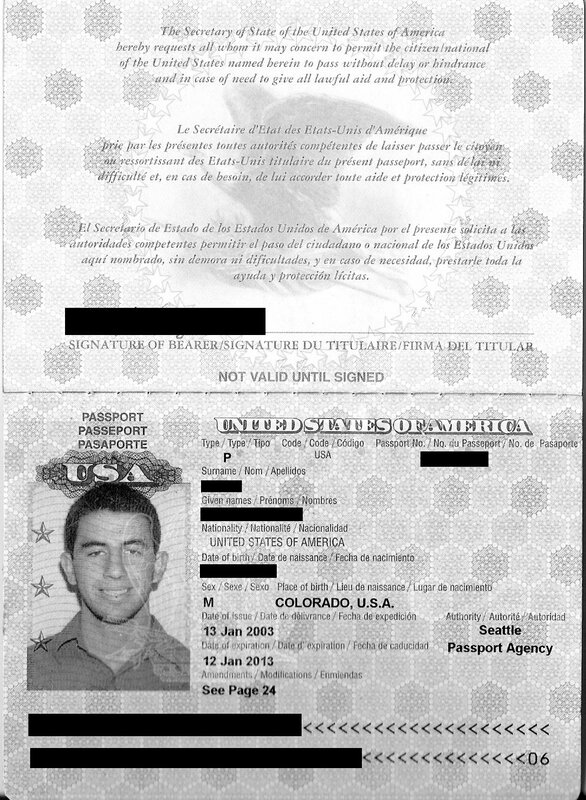 View an example passport picture page. Do not put your address or contact information on your resume since all correspondence goes directly through the Council. The resume should be one to two pages long, specifically focused on teaching English in China. At the top put "Objective: To Teach in China". These are very competitive positions. Emphasize educational background and teaching, including tutoring, public speaking or seminar teaching. MENTION: GPA if 3.00 or above, honors, awards, Dean's list, languages; international travel; honors, musical and sports interests, activities and computer skills, etc. DO NOT MENTION: volunteer work, political work of a controversial nature, construction, waitress work, bartending, or paid/volunteer positions held which do not relate in any way to these teaching positions. Include dates for university attendance and employment. Avoid being technical. View example resumes from a female client and a male one. official, university-generated transcripts. All Chinese universities require transcripts (PDF). copy of your diploma(s) (PDF). Diplomas must be sized to 8 1/2 by 11 inch paper and they must be a copy of the original. We cannot accept photos of framed diplomas. Two letters/emails of recommendation—essentially character references, on letterhead—from employers, professors, or a family doctor (Microsoft Word-compatible formats [DOC, DOCX, RTF] or PDF format). They may arrive up to two weeks after the other documents. Letters/emails from personal friends are not acceptable. These letters/emails should state how long the person has known you, in what capacity and specifically what they think of you as a person and your ability to work in a very difficult, challenging environment as a teacher and how successful they think you will be from their past observations of you. A few good paragraphs is adequate. One official color visa size photo of yourself (JPEG, GIF or PDF) which will also be submitted to the university for their official documents. Go to Kinkos, Walgreens, Rite Aid or Walmart or some place that specializes in official visa/passport photos. You will also need to take 10 visa/passport photos with you to China. Procedure for program fee payments: Your $150 non-refundable application-processing fee—$300 if a non-teaching spouse or partner is accompanying you—is due with your application. After submitting your application, you will receive an email with a link to our PayPal page. If you prefer, you may also send a check to the mailing address found on our contact page. Half of all additional fees are due five days after receiving CCC's official acceptance letter. If we do not hear from you within five days we will assume you have decided not to attend our program. Balance of fees is due 90 days after receiving the acceptance letter, or by July 15, which ever comes first. You are a professional teacher or professorother type of professionalgraduating seniorrecent college graduate applying as an individualpart of a couple for the August-June program. Are you still studying to obtain a BA/BS? CRITICAL: YOU MUST HAVE YOUR DIPLOMA IN HAND BY MID JUNE. IT TAKES CHINESE UNIVERSITIES AND THE GOVERNMENT MANY MONTHS TO PROCESS APPLICATIONS AND APPLY FOR THE WORK VISA SO THEY MUST HAVE YOUR UNIVERSITY DIPLOMA NO LATER THAN MID-JUNE. From which university/college did you graduate? If still in college you must tell us the exact date of graduation and exact date you will receive your diploma. From which university/college will you graduate? IMPORTANT: Do you have any of the following health conditions or other health concerns we should be aware of before accepting you into the program or placing you in China? Chinese universities will terminate contracts and send you back to North America at your expense if you have health problems that interfere with your ability to teach and function in an often stressful and challenging environment. If the Council discovers that you have any of the below, which could interfere with your ability to teach and you were not forthcoming we reserve the right to terminate your contract. No fees will be refunded. Also please note that nose or mouth piercings or large, visible tattoos are totally unacceptable for a teaching position in China on this program. Are there any other health concerns we should know about? If not, write "No"
What do you hope to personally accomplish, and what challenges do you think you will encounter living and teaching in China? Also, why do you think you will make a good teacher? This essay should be about 300 words. Do you plan on being out of the U.S. for more than a few weeks at any time between now and your departure date? If so, when will you be gone, and will you be accessible by phone and/or email? It is important that we be able to reach you in the spring. Please list all countries in which you have traveled or lived, and length of stay. Do you speak and/or read any foreign languages? How well? Are you applying to any other China/Asia placement organizations and if so, which ones? Also, are you waiting to hear from graduate school, law school, or hear about a specific job that will delay your decision? If so, when do you expect to hear from them? How did you learn about the Colorado China Council? Do you have dual citizenship, i.e., passports from two countries? If so, from which ones? Yes, I hereby agree to the terms and conditions stipulated in the Colorado China Council's General Liability Release.